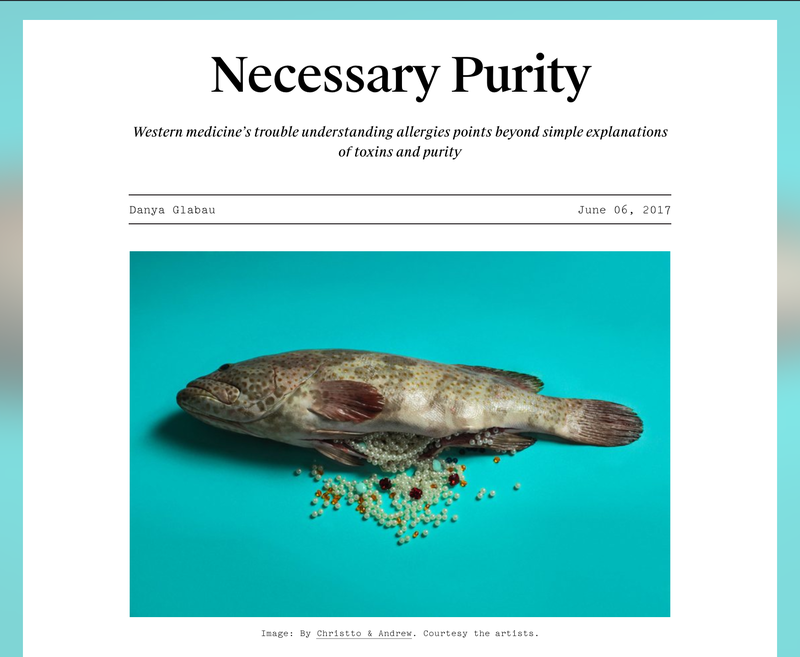 Necessary Purity, my newest new essay about situated needs for material purity, the nature of scientific facts, and the challenges of living with food allergy, is available at Real Life. Rising rates of food allergies seems to validate the menacing sense that the postindustrial world is inimical to human health. It is even tempting to regard food allergy as the signature disease of modernity, as historian Mark Jackson has suggested. Some speculate that people with food allergies may be canaries in the coal mine, their hypervigilant bodies warning us all about the eventual dangers we’ll face from exposure to the pesticides and industrial additives of the unclean modern world. If so, a return to pure, clean living — avoiding pollution, pesticides, the hustle and bustle of modern life — would seem to be the solution. But the forms of scientific evidence and analysis are not — at least, not yet — fully enough elaborated to explain food allergy in terms of our general condition of contamination. Biomedicine, which treats biology as the exclusive explanation for sickness, does not make such grand claims. In scientific terms, food allergy involves complex, as yet incompletely understood interactions between inherited genetic and epigenetic dispositions, conditions in the womb, microbial colonization in the first moments of life, and the precise timing and route of early-life exposure to foods. Tying modern life to food allergy scientifically — at either the level of the individual body or the level of society — remains a work in progress, often driven by non-scientists who experience bodily changes as a response to modernity. Image: By Christto & Andrew. Courtesy the artists.